You will receive an email confirmation notice from Leading Edge Physiotherapy RunWild. Only online registrations will be accepted. How many people are expected to participate in 2019? Registration is capped at 2,000 participants. We expect to sell out. For the safety of participants, age restrictions are in place for the Half Marathon. Half Marathon participants must be 14 years or older on race day. Can I secure pledges to help raise money for the St. Albert Sturgeon Hospice Association, the Zebra Child Protection Centre or the St. Albert Seniors Association? Yes please. Every dollar counts towards our fund raising goal of $100,000. We challenge you to collect $5/km from each of your pledges, but even $1/km would help our charities significantly. How far is the half-marathon? Can I switch to a different race event? Yes. The deadline to switch events is midnight on April 28, 2019. Please email info@runwild.ca. After the deadline, those who switch will not be timed. All transfers are subject to a $5.00 processing fee and there will be no refunds if transferring to a lesser race. A race bib must be worn at all times during the race events. If you switch race distances you are not guaranteed a finisher medal. All registrations are final. No refunds, exchanges, deferrals or substitutions are available on any registration. How do I get my Race Package (bib, timing chip, maps, etc.)? **Note that there are no group or multi-package pick-ups in the first two hours of package pick-up. *Printed confirmation or picture ID is required for package pick-up. If you cannot make it to pick up your package, you can have a friend or family member pick it up on your behalf with your printed confirmation. May I pick up someone else’s race package? Yes. If you are picking up someone else’s race package, you need to have your own picture ID with you and your friend’s correct name that they registered with. Can I register and pick up Race Package on event day? No, Race Packages are not available for pick up on race day. Maps are provided on the Events pages in the Events section and are available for download. To get the most out of the event, please be sure to familiarize yourself with the course ahead of time. What do I receive for participating in the race? All participants receive a race package with a T-shirt, a race bib and sponsor items. All registered participants will have access to post race nutrition and those 18 years or older will receive a complimentary beer from the beer gardens. Individuals that complete any of the race events will receive a medal. Can my dog run/walk with me in any of the races? With the exception of the hearing and vision impaired participants, no, we are NOT allowing dogs on any race routes. Can I run/walk with my baby stroller in any of the races? The 5km race is the ONLY route we are allowing strollers. Timing is recorded by the ChronoTrack B-Tag System. It records the time at which you cross the mat at the Start line and when you cross the mat at the Finish line, then calculates your net time. There is no other timing system, therefore if an accurate running time is important to you, it is imperative that you have a chip. No. All participants must use the ChronoTrack B-Tag Chip provided in your Race Package and attached to the back of the race bib. There will be no access to St. Anne Street. There will be parking available in the lot across from St. Albert Place, and along Perron Street. The start area for all RunWild events except the WildOnes Kids MaraFun is located in front of St. Albert Place, 5 St. Anne Street. The finish area for all RunWild events is located in the parking lot of Lions Park. Is there somewhere to store my belongings during the race? Yes. There will be a bag drop location in front of St. Albert Place near the start line. The average temperature in St. Albert during May is a low of 3ºC and a high of 17ºC. Yes. Walkers are invited to enter in all race events. The Pace Team will be available for the Half Marathon for 1:30, 1:45, 2, 2:15 and 2:30. Each pacer’s goal time will be clearly indicated. At the race start, line up near your pacer, but please do not crowd them – allow room for other runners to pass. Yes, there are markers along the route. Directional arrows will also be in place. Half Marathoners follow the BLUE, 10Kers follow the GREY, and 5Kers follow the BLACK. Will there be water stations, aid stations and toilets along the routes? Yes, there are water stations, aid stations and toilets along all routes. The Half Marathon will have water stations roughly every 3km. The 5km race will have one (1) and the 10km race will have two (2). Please reference course maps before the race to see the exact locations. Can I wear my headphones/iPod during the run? Not recommended. Leading Edge Physiotherapy RunWild races take place primarily on roadways and we are not able to obtain complete closures of all course route roadways. To ensure the safety of all runners, headphones and music players are not recommended. When runners share a roadway with traffic, it can be very dangerous to wear a headset. Headsets tend to isolate runners from vehicle traffic, signals from race officials or RCMP. 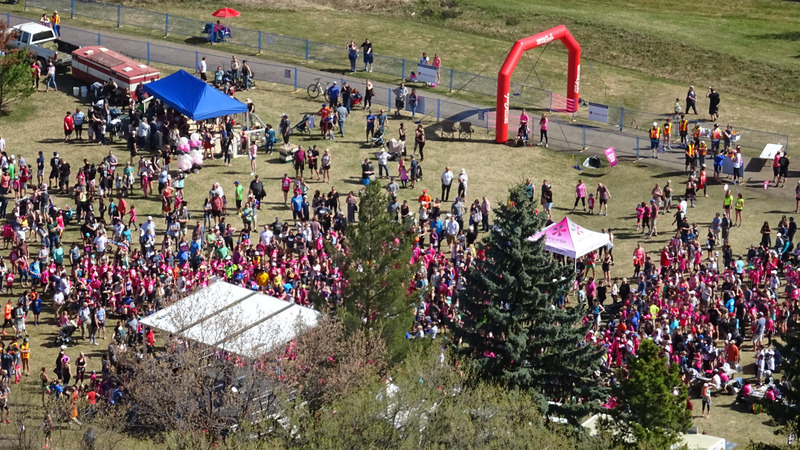 There is post-race nutrition for all registrants, Everyone is invited to join us in Lions Park for entertainment, an awards ceremony, vendors, a kids' fun zone including a petting zoo, inflatables, face painting, balloon artists and much more! Bring your friends and family members down to celebrate your achievement! Individuals that complete any of the race events will receive a medal. Will there be post-race massage? Chips are now disposable and there is no need to return them. Please recycle them accordingly. In the Event Village at Lions Park. Following the event, official race results will be posted on RunWild’s website and available at www.zone4.ca. Chip timing will track your start and finish providing quick and accurate results and all runners must use this system. Your chip is attached to your race bib included in your Race Package. Chips are disposable and are not required to be returned.